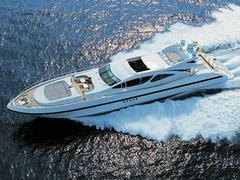 Merle Wood now central agents for Mangusta's Lady Sheila? Launched in 2005, based in the Western Mediterranean and due to appear at the Cannes Boat Show, the 39.5 metre Mangusta superyacht,Lady Sheila (formerly Yianis) has an asking price of €9.9 million. “I originally bought the boat for the current owner,” says Bassam Chahine, at her new Central Agents, Merle Wood & Associates. This year, Lady Sheila underwent a thorough refit including work to the internal décor and the exterior detailing with a complete service of the yacht’s mechanical systems. With five staterooms plus crew quarters, Lady Sheila has a comfortable cruising speed of 35 knots with propulsion provided by KaMeWa waterjets.